Star Trek: The Art of John Eaves Review – AiPT! An extensive look at the space ship design from one of the most influential designers in the modern era of ‘Star Trek’. Star Trek has been around so long it seems to have influenced every generation, including the current one growing up today. Over the years the various series and movies have changed the series for better, for worse, and in some cases so much it becomes unfamiliar. 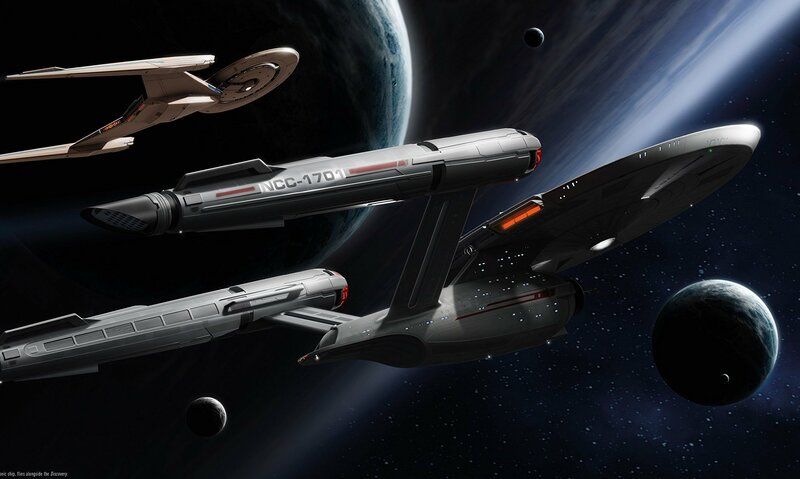 From Kirk to Star Trek Discovery there is one thing that remains the same and that’s the excellent ships. The graphics of these shows have broken new ground, but at their heart are architects who dream about what could be. Certainly, the saucers and thrusters aren’t even possible today, but with the right imagination every ship pushes us to ask, “Why not?” Titan Books recently released a new book dedicated to one of the greatest architects of Star Trek ship technology, John Eaves, and his workspaces multiple movies and shows. Star Trek: The Art of John Eaves represents the most extensive collection of designs and illustrations created by Eaves across the Star Trek Universe. Featuring fascinating pencil sketches and stunning concept art, this visually dynamic book gives fans a unique in-depth look into Eaves’ creative vision and the wealth of his remarkable work at the center of this spectacular franchise. How do you make the Borg ship work. Eaves is incredibly influential in the design of ships, props, and locations. His main focus over the years was certainly spaceships, though, and it’s an impressive book if you love the design of a good Enterprise. This book also utlilizes a first person perspective as Eaves gives it an almost private-diary point of view. That includes insider info (like how a fellow designer called out sick so he could work on Enterprise) and a first hand look at the process of designing some of the coolest space ships in science fiction. This book is organized into five chapters, first opening with a foreword then diving into the five movies Eaves worked on, cutting to the television series, fleshing out his work on the new Kelvin Timeline movies by J.J. Abrams, and then capping everything off with Star Trek Discovery. All told this book collects Eaves’ work from 1989 up till today. That’s 20 years of sketches, designs, and perspective on the industry. Page after page is filled with excellent sketches, paintings, 3D models, and more. It’s extensive to say the least and you will certainly feel like you’re getting a look at nearly everything Eaves created. The commentary is particularly good too. Eaves seems to let it all hang out, mentioning what it was like to work with his coworkers, being on a team, and what he was doing when he was asked to do the various projects here. That includes how he worked on Spider-Man: Homecoming when asked about Discovery, or how he worked with someone previously on Captain America: Civil War. He’s certainly not bragging when he drops details like this. On the contrary, he’s simply sharing what was going on in his work life throughout this books coverage. There are fun anecdotes about what he was trying to accomplish and what kind of research went into designs. If you’re an architect, or know one, you’re going to want to pick this up. Star Trek enthusiasts should enjoy this since it captures the creation process when it comes to story. More than once Eaves mentions how some designs had little instruction so he’d need to dive a bit into the use of a ship. Take for instance a shuttle Data uses in Star Trek Insurrection. Aside from “Data flies erratically through the atmosphere,” Eaves had nothing to go on. That’s an interesting perspective since a lot of what he did was solve problems. There are also regrets within Eaves’ commentary as he reflects on ships that could have been sleeker or more interesting. Just flipping through this book brought back childhood memories of the films and shows. Some of the commentary can seem repetitive. As a coffee table book I suspect most won’t notice this, but since I read this in one sitting I noticed Eaves point out how much fun he had, or how great it was working with folks. It’s nice to know Eaves had a great time, but it doesn’t add much to the reading experience. Think you know everything about Star Trek? Think again. Read this book to get an even more completist look at one of the greatest series of all time. A strong collection that highlights more spaceships than you can handle. John Eaves has a lot to do with why Star Trek and all its ships look the way they do. Bravo sir.